Earlier, I posted some of my thoughts about digital converter boxes. There are only a few retailers in our area who will accept the converter box coupons, so the choices are limited to four units. I had already ruled out the RCA DTA800 and the Magnavox TB100MW9 for reasons detailed in my other post. This left the Insignia NS-DXA1 or the Zenith DTT900. Both are made by the same manufacturer and are said to be identical, so I felt that either one would be a good choice. I chose the Insignia NS-DXA1, which is sold by Best Buy. Last week, I checked with the nearest store and they had plenty in stock. The final cost was $20 after using one of our converter box coupons. The cashier said that the boxes were flying off the shelves, but that they were having no problems keeping them in stock. Just out of curiosity, I checked Walmart to see if they had any of the Magnavox TB100MW9. They didn’t, and the space on their shelves was empty. The store manager told me that they should have more in two weeks, but that demand had been huge. Also out of curiosity, I checked Radio Shack and they had around four of the Zenith DTT900. I am very impressed with the Insignia NS-DXA1. It is a compact black metal unit, slightly larger than a paperback book. It has ventilation holes on the top, and runs quiet and cool to the touch. Some people have complained about heat problems with the Magnavox TB100MW9, but I doubt that heat will be a problem for the NS-DXA1. After I hooked up the NS-DXA1 and turned it on, a brief setup menu appeared. Once I confirmed some settings, it performed a channel scan. The channel scan detected five channels (four of which were sub-channels of the same station). After thanking me for completing the setup, it switched to the first channel. I have had little experience with over-the-air digital television, and I was pleasantly surprised. The picture is sharp, the sound clear, and the reception doesn’t fade at all. Our over-the-air reception seems dismal by comparison. Only rarely does the digital signal drop out or artifact, and I am only using a simple indoor loop antenna. I am sure that a better antenna would stop any dropouts. I knew that two stations would be strong enough for us to receive, but I had wondered about four other stations. I had expected that all of them would be too weak, but I was curious to see what kind of signal strength they had. I was surprised by the fact that not a single station had any measurable signal strength at all. This isn’t a complaint with the NS-DXA1, whose performance with low strength signals is reputed to be quite good, but rather with the state of the signals available in our area. I intend to try out an external antenna soon and I hope to get a better idea of the signal strengths. The simple program guide in the NS-DXA1 displays the name of the current program and the next program. It stores this information for each channel, and you can also see program names for a channel that you aren’t watching. However, if you haven’t watched a channel for a while, then you might have to switch back to reload its program information. 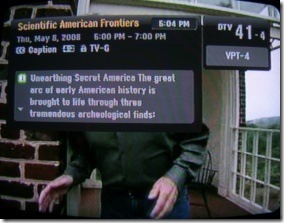 You can also display a description of the program you are currently watching. This is one of the few limitations of the NS-DXA1: the simple program guide is quite simple. The name makes it sound as though there is also a more advanced program guide, but the simple program guide is all there is. 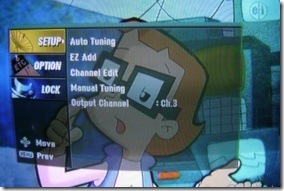 Some digital tuners have a six-hour program guide, but the NS-DXA1 is unable to look beyond the next program. More troubling to me is that you can’t see a description for any program other than the one you are watching; not another channel or even the next program. This is a minor quibble, and even a simple program guide is far better than having no program guide with an analog televisions. I am very pleased with the Insignia NS-DXA1. It is a well-built unit that does exactly what it promises. I like it and I plan to use our remaining coupon to buy another. Filed under Television and Antennas and tagged HDTV, TV.